This post is the first in a series discussing how FFLM’s work in the Lake Michigan watershed is contributing to climate change adaptation and mitigation. The data is clear: The earth’s climate is changing. 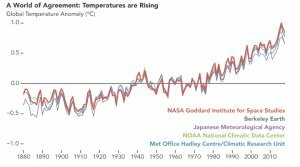 The top five hottest years on record since 1880, when NASA began tracking annual average temperatures, have been within the past 10 years. Currently, annual global average temperature is about 1° Celsius hotter than the 139-year average, and trends show it rising. Since the atmosphere is, on average, warmer, it holds more water vapor, resulting in more frequent and severe weather events. The effects have been devastating globally. In the Midwest the amount of rain falling in the heaviest storms has increased by 37 percent. Wisconsin’s 2018 flooding was so severe that then-governor Walker declared a statewide emergency and called in the National Guard to help victims. These unprecedented rains have eroded our soils, washed pollutants into our waters, and proven more costly and dangerous than we might have imagined. FFLM-funded projects are helping Wisconsin permanently adapt to the extreme precipitation that comes with climate change. 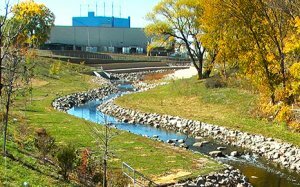 Green infrastructure, increased wetland acreage, and rivers and streams restored to free-flowing are providing stormwater management and flood abatement. 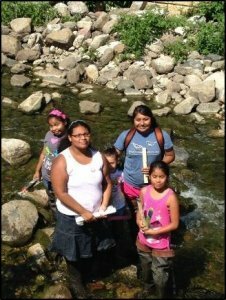 Streambank stabilization, wetland restorations, and agricultural projects to absorb pollutants and keep nutrients and sediment in place are improving water quality. All of this is increasing community resiliency in the face of more intense weather. Our project database is full of examples. Take our investments in the Pulaski Park neighborhood, a densely developed area where Kinnickinnic River flooding in recent years has inundated parks, residences, and commercial areas. Our grantee Sixteenth Street Community Health Centers engaged residents and other stakeholders to install rain barrels, rain gardens, bioswales, porous materials, and other green infrastructure on public and private property to manage stormwater throughout the neighborhood. 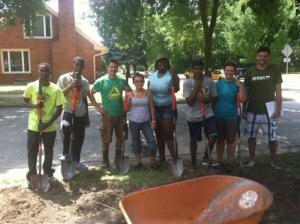 In a big step for the neighborhood, last summer MMSD removed the concrete that lined the the stretch of the Kinnickinnic River that runs through the park and widened the river channel. “Sixteenth Street Community Health Centers has enjoyed being involved in the cross-sector project approach to green infrastructure implementation on the south side. Engaging residents in the process to build awareness and understanding in parallel with the work that MMSD is doing along the Kinnickinnic River is a systems approach to green infrastructure solutions to climate change,” said Jamie Ferschinger, Director of Environmental Health at Sixteenth Street. We continuously update our statistics on the social and economic returns these projects have generated for Wisconsin and are also developing measures of the ecological benefits, so stay tuned.